When Google Classroom launched in 2014 it was immediately a valuable tool to save educators time and increase connection with students. Since then Google has continued to make updates to Classroom, bringing new features and improvements.Google has been very busy over the summer for the start of the new 2018 school year. Classroom has received nine updates, and has three more to come in the near future. In this blog post we will take a look at each of these updates, how they work, and what impact they will have on teaching and learning. One of the most noticeable changes to Classroom is the addition of a new tab for a "Classwork" page. In the past your Assignments and Questions were part of the Stream, along with the Announcements for the class. Although it was convenient to have everything in one place, it also could become very messy and confusing once a lot of content was posted.To help clean this up, the Assignments and Questions have been moved to the new Classwork page. For even more organization you can use Topics to group your Assignments and Questions, and can move each item up and down to put everything in exactly the order you want. This is a helpful change from the chronological order of the Stream, and looks much more like a traditional learning management system with course content arranged by units. The Stream page has always existed as part of Classroom, but as mentioned above, it could get crowded with Announcements, Assignments, and Questions all in one place.With the new updates, the Stream now only contains teacher Announcements, student Posts (if enabled), and any replies to these. Basically it is now a discussion stream. The Assignments and Questions have been moved to the Classwork page. It is important to note though, a couple of other features have been removed from the Stream. To help organize the Stream in the past, you had the option to add a Topic to an announcement for filtering purposes, as well as the option to move a post to the top of the Stream for better visibility.Now that Assignments and Questions have been moved to the Classwork page, the Stream no longer has Topics or the "Move to top" option. Posts in the Stream will simply appear in chronological order with the newest at the top. The class title, description, and location can now be edited on the Settings page. The option to add co-teachers in now on the People page. The links to access the class calendar and Drive folder are now on the Classwork page. The one big thing missing however is the ability to add class resources. The About page was a nice location to provide easy access to common websites, a syllabus, style guides, and other reference materials for students. If you previously added such content to the About page, it is still visible through the "About" link on the Stream page, but is no longer editable. Thankfully this change will be addressed in an update coming soon, which is covered further down in this post. One of the most useful updates to Classroom is an improvement to accessing and grading student work. In the past you could access all of the turned in work from your students in one place, but you still needed to open each document separately. Now Classroom allows you toquickly and easily switch from one student document to the next. First, simply begin by opening a student document as normal from the assignment page in Classroom. You will notice that the student file will open in a special new window with two extra panels. At the top will be a panel where you can easily rotate through each of your students using either the left and right arrows, or using the drop-down student name menu. On the right side will be another panel that will list all of the files the student has submitted for that assignment. If the student has more than one file you can just click through the list to open each one. In addition to being able to easily switch between student documents, the new Classroom grading view also provides you with several convenient ways to provide feedback to students. First you can enter a grade directly in the right-hand panel instead of having to go back to the assignment page. Second, below the grade there is a spot to send the student a private comment. Again this is much more convenient while grading the file than having to find this option back on the assignment page. Third, and completely new, is the option to maintain and use a comment bank on the grading screen. Click the "Comment bank" link at the top of the right-hand panel. This will open up your comment bank. You can add new content by clicking "Add to comment bank". You can even type in or paste in multiple comments at once by having a line break after each one. To use these comments you can simply open the comment bank and then copy and paste the desired text into a normal marginal comment in the student document. If you have lots of comments, you can use the search button in the comment bank to narrow it down to the entries you are looking for. Of all the updates, this one may likely save you the most time of any. We have always had the ability to reuse an old Assignment or Question. This was a convenient way to copy an assignment we did the year before without having to recreate everything. As nice as this was, it only worked for one post at a time.Now Classroom gives you to option to copy an entire class all at once! Go to the homepage for Google Classroom. Locate the class you wish to copy and click the "three-dots" button in the top right corner of the class tile. Choose "Copy" from the drop-down menu. You can now edit the name, section, and subject for your new class. You will now have a copy of the class. What gets copied in this process are the Topics, Assignments, and Questions on the Classwork page. However all of the items are set to "Draft" so you can publish them to your students one by one as needed. Note: Posts from the Stream are not copied. This feature will be incredibly helpful for a teacher who wants to reuse all of the content from a previous year in a new class for this year. This will also be helpful for people using Google Classroom as an LMS. Someone could create a master course in Classroom, then anyone added as a co-teacher could make a copy of the master course to use with their students. The final new option is the ability to turn off all notifications for an entire class all at once. Previously you could turn off certain types of notifications, and still can, but now you can disable all of them for a class. This may be especially helpful for someone who is a co-teacher for a class, but does not want to be receiving notifications. First click the menu button in the top left corner of Classroom. Scroll down and choose "Settings". At the bottom of the "Notifications" section you will find the "Class notifications" option. Click on that option to get a list of all your classes. You can now turn notifications on or off for any class in the list. 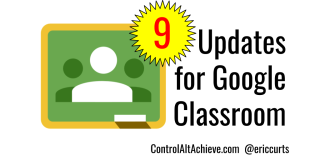 In addition to the nine updates that have already rolled out for this school year, Google has shared about three more that will be coming soon. Now that the "About" page is being phased out, teachers need a place to post class resources. Soon we will be able to do this on the Classwork page. In addition to the Assignments and Questions there, you will be able to add materials including a class syllabus, common websites, class policy documents, and more. This change makes Classroom much more like an LMS with the ability to add and structure all of the content for a course in one place. Classes that were created before these updates do not have a Classwork page. Instead the Assignments and Questions are still in the Stream like before. Soon you will have the ability to convert older classes to the new format with their own Classwork page. It is already easy to add a Google Form Quiz to Classroom as an Assignment. However, we are being told that soon you will have the ability to create a new Google Form Quiz from scratch right inside of Classroom for even more convenience.